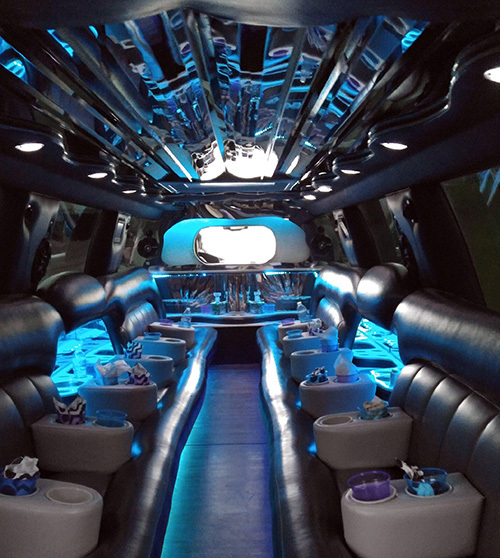 Entertainment Express Inc. is a full-service limo and party bus company in Dearborn, MI. Our services are available 24 hours a day, 7 days a week to all Michigan cities and border states. We specialize in punctual and dependable luxury transportation for all your special occasions. All our chauffeurs are fully licensed and insured to protect our clients. Contact us and we’ll help you feel like the star that you are! At Entertainment Express Inc., we offer many different services, from limo to party bus rental, with a wide variety of vehicle options, including Hummers, Lincolns, Escalades and more. Our limo service is located in Dearborn, MI, but we will travel to all Michigan cities and bordering states. Unsure if you’re in our area? Contact us and we’ll be happy to work something out for you. Depending on what limo model you rent, we’re able to fit 7 to 20 passengers. Select what model you want to ride in style in and what you’d like your limo to offer. We’ll pick you up and drive you to your destination, guaranteeing you’ll feel like a star before, during and after your ride. We also offer party bus rental in Dearborn, MI. 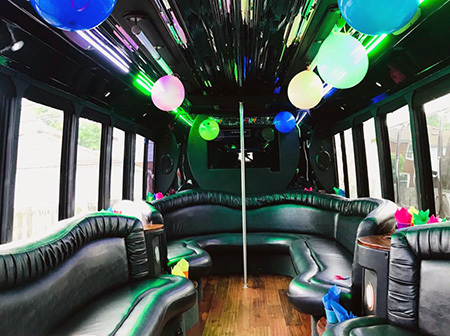 We take pride in being Michigan’s only double decker party bus service, with several different party bus and double decker bus options depending on the occasion and number of passengers in your party. As a full-service transportation business in Dearborn, MI, we can customize your transportation needs exactly as you require them. Order a limo or party bus and we’ll decorate it for you to properly celebrate a birthday or wedding. We want to make your entire experience memorable! We show up on time every time. Our large travel vicinity allows us to travel to all Michigan cities and bordering states. We’re very flexible. We’ll work with your schedule to provide you with an unforgettable experience on your special night. Order a limo or party bus and we’ll decorate it for you. From birthdays to weddings, we’ve got you covered. We specialize in complimentary meet and greet service at airports and seaports. Let us know where you’ll be and we’ll be there too. We run many different promotional offers throughout the year, guaranteeing you the best possible deal. Interested in renting a limo or party bus? Contact us at 313-277-5000 or send us a message thru the contact form for a free quote. We look forward to making you feel like a star! Licensed in Michigan! Serving ALL of the Detroit Metro Area!